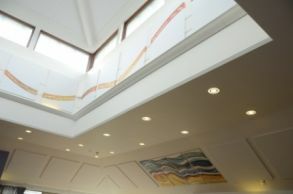 Arts for Health was asked to assist with implementing the new acoustic panels which were installed on Brocton Ward. Some of the panels are plain white so as not to detract from existing artwork, while up in the atrium we drew inspiration from a beach scene collage mural which was created by service users earlier in the year. Taking colour and the curves of that piece, Arts For Health worked with a designer at local printers Imagaprint to incorporate the text of a poem – Journey Soon – which we had commissioned as part of our tenth birthday celebrations. They supplied the printed artwork which was then wrapped around the panels and installed by Classic Acoustics – all in the space of a week! The difference on the ward is palpable. The lounge, where the panels have been installed, is a large area open to the three bedroom corridors with lots of hard surfaces, sloping ceilings and a high atrium, all of which contribute to the reverberation and echoing of sound in the space. This was particularly difficult for patients who hear voices or who have tinnitus. The acoustic panels soak up some of that sound and help to muffle it. “It’s brilliant, you don’t get the echo. It can get noisy on the ward; you still hear the noise, but not the extra bit. It looks good as well.” – D (inpatient on Brocton). “When we had the community meeting on Tuesday, we noticed the difference.” Renie Costello, Acitivity Co-Ordinator. Plans are in place to install panels on Norbury, Milford and Chebsey wards, working with artists to create individual pieces for each ward.